Last week I shared how to make pretty fondant flowers, and promised to show how to use them soon. Well, here I am, as promised! This past weekend my family and I enjoy attending a big luau party at a friends house. We have enjoyed friendship with the host family about 10 years, and most every one of those years they’ve hosted a huge, beautiful luau party. 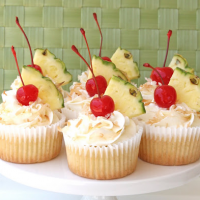 For the past several years I have had the pleasure of making special desserts for the party. Two years ago I took the time to photograph the whole set-up, here is the Lange Luau 2010 (along with some photos of the incredible yard the party is held in). This year, I didn’t photograph everything together, but I have broken the desserts into several different posts, to show you each special dessert. Of course decorated cookies need to be included! Since I have made cookies for this party for several years, I try to come up with some slightly new designs each year. I have several designs to share (some will be in future posts), but today I’ll start with my favorites! In fact, these may be some of my favorite cookies ever! 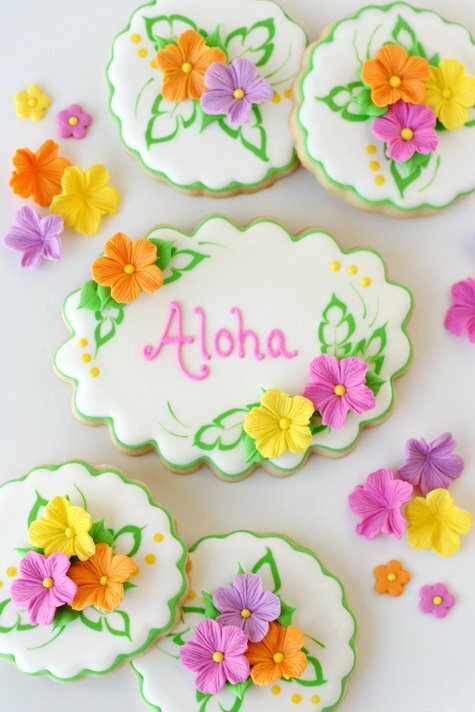 Would you like to make some pretty Luau Cookies? First, you’ll need a batch of cookies made with my Sugar Cookie Recipe. Next, prepare a batch of royal icing (here’s my Royal Icing Recipe). Thick/piping consistency– This icing stays in place when piped, and does not settle into a pool. This is a bit thicker than the consistency of traditional toothpaste. Medium consistency– This is just thick enough to stay in place when piped, but thin enough to settle into a pool after a few seconds. When mixing this icing, draw a line with a spoon through the bowl of icing, and the line should heal (disappear) in 12-15 seconds. This is about the consistency of shampoo. Thin/Flood consistency– Slightly thinner than medium consistency. This is good for filling in large cookies quickly. 1. Outline your cookie (I used a scalloped circle) with green icing (in either a thick or medium consistency), using a #2 or #1.5 tip. Allow outline to set up (15 minutes or more), then fill in/flood the cookie with white medium (or flood) consistency icing. 2.-6. 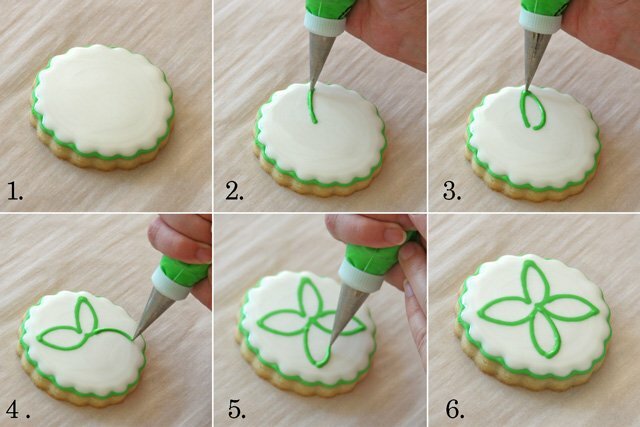 Once the cookie is filled in, immediately, draw simple leaf shapes using green, medium consistency icing (using a #2 or #1.5 tip). 1. 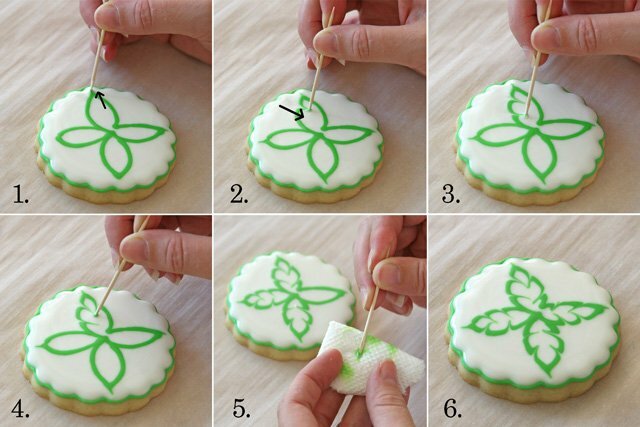 Working quickly, while the icing is still wet, use a toothpick to draw from the inside of each leaf, out toward the tip, creating a little point at the top of each leaf shape. 2.- 4. Now, drag your toothpick in the opposite direction (from the outside of the leaf, toward the inside), around the edges of the leaf, creating jagged edges. 5. Throughout the process, use a slightly damp cloth or paper towel to wipe off your toothpick between each drag on the cookie. 1.-2. Continue, while the icing is still wet…. Dip your toothpick into an area with green icing, then use that icing to add a thin green “vein” up the center of the leaf. 3.-4. Again, dip your toothpick in an area with some green icing, then drag your toothpick to create a few flourishes, as desired. 5.-6. Add a few yellow dots (if desired), using yellow, medium consistency icing. Now, allow the cookie to dry. 1. 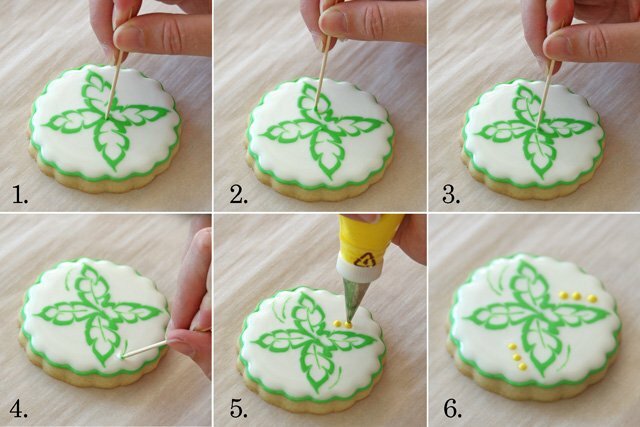 Once the cookie is dry (2-8 hours), add 3-D leaves. I used a #352 Wilton tip. Feel free to use any leaf tip you prefer. 2.-3. Add a few leaves, using green, thick consistency icing. 4.-6. Add (dry) fondant flowers, as desired. Adding a few leaves in between, as needed. Allow the cookie to dry fully before packaging (4-8 hours). Here is the direct link to my post on How to Make Fondant Flowers, as I used here. Feel free to use royal icing flowers (Sweet Sugar Belle has some nice tutorials HERE and HERE). Or purchase pre-made gumpaste, fondant, or royal icing flowers. Especially if you make your own fondant flowers (as I did), these cookies will be a bit time consuming. 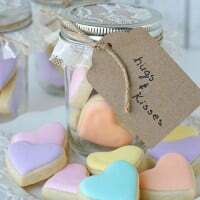 But a few extra detailed cookies in a collection with other, simpler designs can create a really beautiful display! Because of the 3-D flowers, these would need to be packaged gently (if at all) and thus, would not be ideal for shipping. I’d be interested in your feedback on this set. Do you like me sharing more complex designs from time to time, or do you prefer simpler designs? 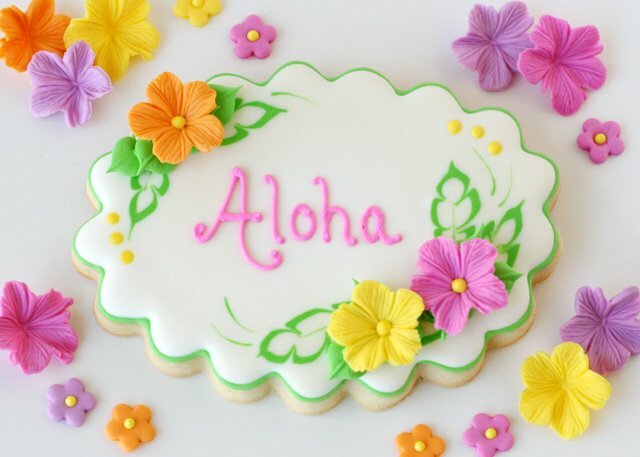 *Supply note- The large, scalloped oval cookie cutter I used for the “Aloha” cookie is from Copper Gifts. The scalloped circle cutter is from Cost Plus World Market (in store). ABSOLUTELY BEAUTIFUL! Love how the colors come together so beautifully. So pretty to give my niece.. Thanks for the instructions! I don’t mind at all-I love to read about more complex cookies even though I am a beginner. Your tutorial is soo easy to understand. Please keep teaching us new things! Your work is beautiful! These are incredible! I’m so jealous of your skill. Although I’ve never decorated cookies–as much as I’d like to try–I think it’s a fantastic idea to include more complex designs in with simpler ones as well. It gives someone at every skill level something to try and those of us who are beginners something to strive for! wow! those are gorgeous! your tutorial is extremely helpful and easy to understand. thanks so much! Just gorgeous…wow. You are so talented…God bless you! Your cookies are beautiful, as your work alway is. I love seeing all of the different methods and the harder designs encourage me to try new things. Hi Shirley! Thanks so much! Oh my goodness, those leaves! The flood leaves…that look just like palm leaves!!! BRILLIANT!!!!! These cookies are beautiful! Love the flowers! I love these!! They are like pure sunshine in cookie form! 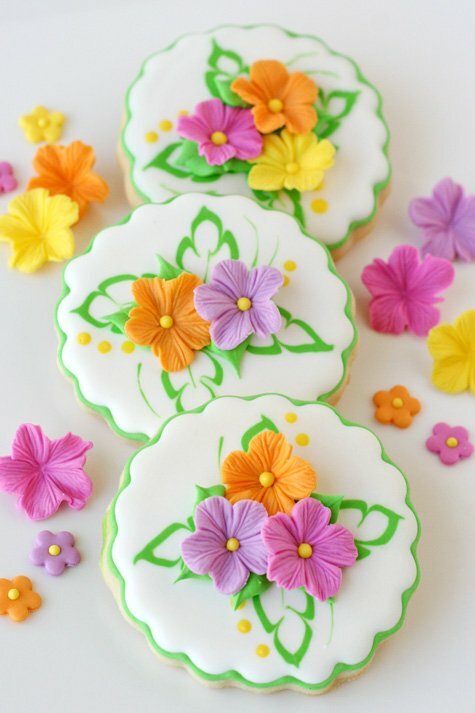 I was thinking to make flower cookies this week..
Awww some of the prettiest cookies I’ve ever seen! wow, it looks so good! Amazing cookies, great work! 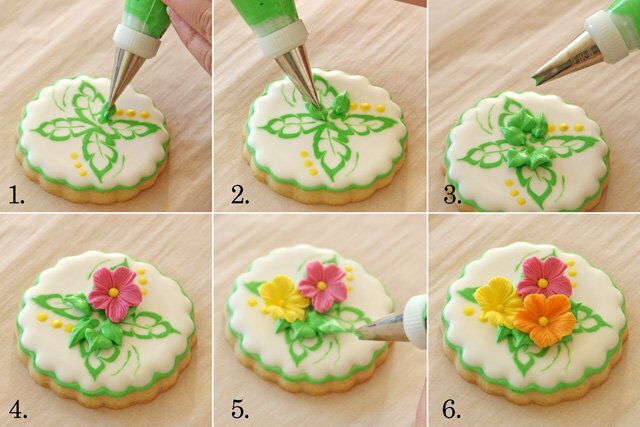 I loved the tutorial on the flowers you posted earlier and now that I see this beautiful cookie, I know that I will be buying the tools needed to make these flowers. thanks for the detailed instructions that you post in your tutorials. I’m in love with these colors…so pretty!! BEAUTIFUL!!!!!! I wish I was so talented. These are gorgeous, Glory! I love how you did the wet-on-wet leaves!!! I’m working on a flower set this week and will definitely incorporate your ideas into the set. Thank you for sharing! I love your tutorials. Thank You for sharing. I don’t usually ask for help, I just wander on internet till Y find the answer. Can you, pretty please, tell me if there is something I could put in the royal icing when I make lacey decorations on waxpaper to make them stronger? I made some butterflies for my cupcakes, but they break so easily, and so breaks my heart when I see them ruined. Thank You. (Excuse my english). Lovely cookies, I like the colors you used and the technique for making the leaf at the bottom of the cookie is great. Thank you for your kind answer. Glory, I work with egg whites, but I have a can of meringue. i don’t like the smell of it. Do you think it would be better with meringue? Come to my blog, if you want to see how beautiful the little butterfy is on my cupcake. I had to fix it tree times before I took the pics. With all my love. Rita, Yes, I would recommend trying merigue powder, I think it may help the final icing be stronger. Your butterflies are so beautiful! If you are doing work that delicate, you are bound to have some breakage, but I hope you can find a solution that saves you a bit of headache! Your wet on wet palm leaf is beautiful, I don’t know how you thought of that! Brilliant. Lovely work as always! I agree witj everyone: these are BEAUTIFUL! I really like reading your tutorials even though I may not make the design, but if I did then I would know where to look for help! Great work! Love you! Love these, they are so pretty. Thanks for the tutorial! You really make the loveliest things, Glory! Your instructions and photographs are second to none and I really appreciate how precise you are – it shows such a commitment to detail and to your readers’ understanding. It also shows what a caring and considerate nature you have…to showcase your talents in a humble and helpful way. Thank you so, so much! What a FABULOUS tutorial!!! Love all the step by step photos – almost like being there seeing you in action! I think these are one of my favorite cookies you have done! U never fail to impress. Simply wonderful this blog, so beautiful and so useful, I hope to continue teaching us and wowing long. I love how you combined several simple elements to create such a stunning design! The leaves are my favorite part!